Digimarc Corporation , an AIPIA member participating in the upcoming Summit of the Americas (Jersey City 4/5 June), has announced a new 15 year partnership with Microsoft. 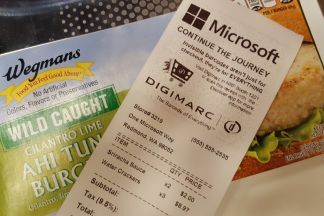 The partnership includes the integration of Digimarc scanning software into Windows, as part of the Windows 10 update. The two companies have worked together to improve retailer operational efficiency and increase consumer engagement with products. Scanning capabilities will now available worldwide in Windows 10-supported devices with built-in cameras. The new built-in support of Digimarc detection technology gives the Windows development community easy access to several powerful technologies. Using standard Windows APIs, developers can benefit from high performance scanning of the most common traditional barcodes found in retail, including QR codes, Digimarc Barcode and DWCode™ by GS1. Potential applications can leverage detection and scanning capabilities within Digimarc software to enable retail associate applications as well as unlimited consumer scenarios. The companies will work together to expand support for additional use cases in future releases.